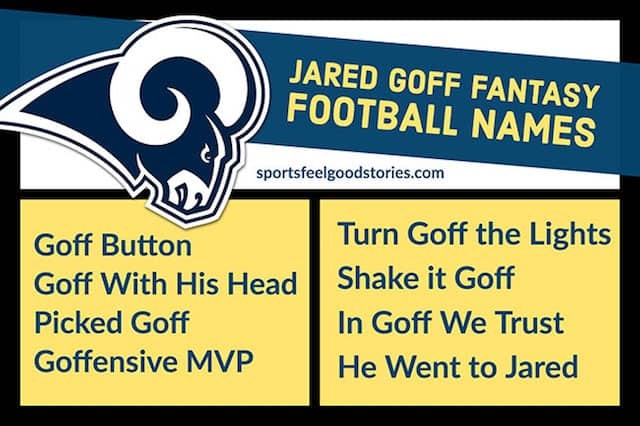 Our Todd Gurley Fantasy Football Names are in honor of the Georgia grad who was twice honored with All-SEC awards. The Rams running back was the tenth selection in the 2015 draft and had a break-through rookie season. He rushed for over 1,000 yards and was named the Offensive Rookie of the Year by the Associated Press. 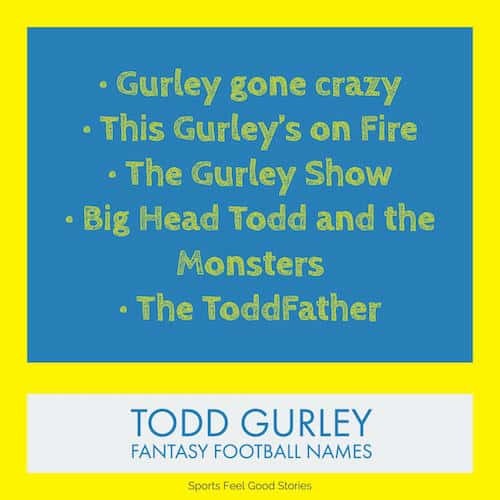 Check out these Todd Gurley Fantasy Football Team Names! Big Head Todd and the Monsters. What other sport did Todd Gurley compete at in high school at a world-class level? Track. Gurley was a sprinter and a hurdler for his high school track team in Tarboro, North Carolina. He finished second in State in the 100 meters with a personal best. Gurleys Just Wanna Have Funchess. • His high school team was three consecutive state football championships. Probably not great preparation for the Rams, but hey, what you’re going to do. • The North Carolina native is a big-time Duke basketball fan and believes Coach K is the best coach ever. • Gurley set an NFL record by rushing for 566 yards in his first four games. His jersey was immediately sent to the Pro Football Hall of Fame. • On his first run from scrimmage in the NFL, Gurly gained two yards. • Gurley loves Jolly Ranchers. Green Apple and Watermelon are his favorite flavors. • Todd wears number 30 on his jersey for the Los Angeles Rams.